In case you missed it, this week I posted information about car seat safety for children. Here are links to all of the information I posted. Vehicle crashes continue to be leading cause of death for children ages 1 – 12 in the U.S. Please take the time today to make sure the children in your life have an appropriate car seat for their age, height, and weight, have a car seat that is installed properly and have a car seat that is used properly every time they are in the car. If you aren’t sure, please feel free to ask me any questions you may have or find out if there is a Car Seat Inspection location near you to make an appointment with a certified technician. If you aren’t able to make it to a technician, here is a checklist that Safe Kids put together for you to use when checking your child’s car seat. Another great resource is the forums at Car-Seat.org. There are many knowledgeable people there, as well as reviews and measurements of various car seats. Also, please feel free to pass this information along to anyone that would benefit from reading it. 2. Do the child’s knees bend comfortably at the edge of the vehicle seat? If you can answer yes to all of these questions, then your child is ready to be in that vehicle’s seat belt. You should perform this test in each vehicle, because your child may be ready in some vehicles, but not all. Just like with booster seats, your child should always use a lap and shoulder belt, not a lap-only belt. You should also make sure your child keeps the shoulder portion of the seat belt in place and not tucked under their arm or behind their back. Without the shoulder portion, there is no protection for the torso, and the child will move forward much more. Make sure that everyone in your car has their own seat belt. Children should never share a seat belt. Children should ride in the back seat of the car until at least 13 years old. Don’t use any products that say they help make the seat belt fit better. They may not make the seat belt fit better at all, such as putting the lap portion up too high on the abdomen instead of down touching the thighs or creating extra space in the shoulder portion making it loose. If the seat belt doesn’t fit properly, then the child should most likely be in a booster seat. Be a good example for you children. Wear your seat belt every time you are in the car and wear it properly. Convertible seats—Seats that “convert” from rear-facing to forward-facing seats. These include 3-in-1 seats. Forward-facing only—Seats can be used forward-facing with a harness for children who weigh up to 40 to 80 pounds (depending on the model). 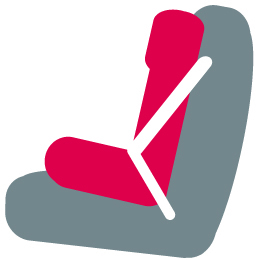 Although manufacturers are not currently making any forward-facing only seats, many remain in use from previous years. Combination seat with harness—Seats can be used forward-facing with a harness for children who weigh up to 40 to 90 pounds (depending on the model) or without the harness as a booster (up to 80–120 pounds, depending on the model). Built-in seats—Some vehicles come with built-in forward-facing seats. Weight and height limits vary. Read your vehicle owner’s manual or contact the manufacturer for details about how to use these seats. Travel vests—Vests can be worn by children between 20 and 168 pounds and can be an option to traditional forward-facing seats. They are useful for when a vehicle has lap-only seat belts in the rear or for children whose weight has exceeded that allowed by car seats. These vests may require use of a top tether. The child should remain in a forward-facing seat until they reach the limits of their car seat. These limits are either the maximum forward-facing weight or height limit, or when their shoulders are even with the top harness position, or when the tips of their ears are even with the top of the seat shell, whichever comes first. In most cases, the weight limit will be 40, 65, or 85 pounds. Another important factor is age. A child should be at least 4 years old before moving out of a 5 point harness and into a booster, if not 5 or 6 years old, depending on their maturity level. Once a child can remain properly positioned in a belt positioning booster for the entire ride, then it is time to make the switch. If needed, higher height and weight limit seats should be used until the child is mature enough for a belt positioning booster. Make sure the harness is positioned at or above your child’s shoulders. 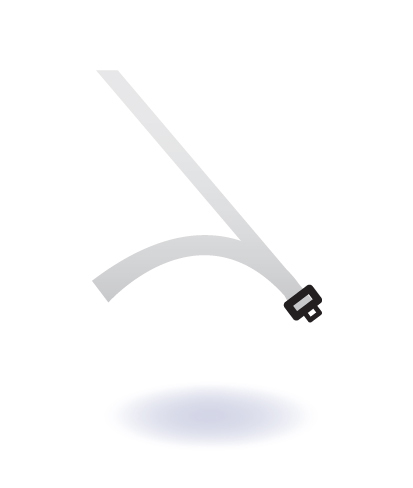 If you are using a convertible seat for forward-facing, make sure the vehicle belt or LATCH strap is routed through the correct belt path of the seat. If installing with a seat belt, make sure that the LATCH strap is secured to the car seat so they are not loose to cause injury. If you are installing with the lower anchors, you may consider buckling the seat belt and locking it before installing the seat so your child will not play with the loose seat belt. Last year for National Child Passenger Safety Week, I featured a series of posts on the various stages of car seats. I will be doing similar posts this year; a lot of the content is the same as it’s always good for a refresher, but some content is updated to reflect changes over the last year. National Child Passenger Safety Week is September 16 – 22, 2012, and you can learn more about it NHTSA’s website here. After the birth of my first daughter, I really started researching child car seats and safety in the car. I found there was a ton of information out there, most I had never heard of before. It motivated me to research what I could and share the information with other parents. I took the week-long class and became a certified Child Passenger Safety Technician (CPST) in October 2008. In April of 2010, I became a Child Passenger Safety Technician Instructor (CPST-I). Last year, Safe Kids USA released a new study. They analyzed data from 79,000 child car seat checklist forms that were completed by Safe Kids coalitions at child safety seat checks around the country for the years 2009-2010. Previously, the National Highway Traffic Safety Administration has done research that shows three out of four child safety seats are improperly installed. The new Safe Kids research says that this percentage has improved slightly, but there is still room for more improvement considering car crashes remain as the leading cause of death in children ages 1 – 12. 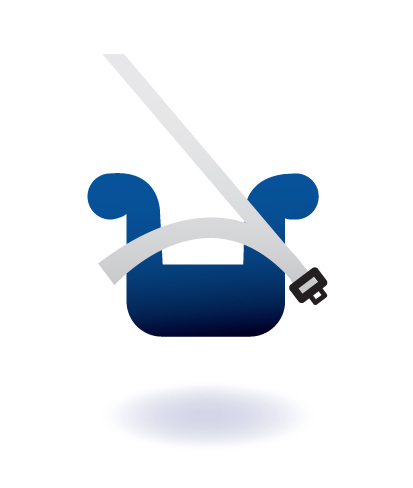 Today, I would like to share some general car seat information and over the next few days, I will share specific information for each of NHTSA’s Four Steps for Kids, rear-facing, forward-facing, booster, and seat belt. At the end of the week, Saturday, September 22, it is National Seat Check Saturday. Safe Kids coalitions and child passenger safety technicians around the country will be holding events for parents to bring their vehicles to get child car seats checked. To find out if there is a location near you that is participating this Saturday, check here or your with your local Safe Kids coalition. Here are some questions you need to ask yourself about your child(ren)’s child car seats. Are you using a child car seat every time you are in the car, even if it is a 2 minute trip down the street? Everyone in the car should be buckled up, every time the car is moving, even in a parking lot. Here is a video from the University of Michigan Transportation Research Institute showing the difference between a properly restrained child and a child not restrained at all at 30 mph. The restrained child would most likely walk away with minimal injuries, while the unrestrained child would suffer life threatening injuries. Are you using the proper car seat based on your child’s age, height, and weight? Using a proper child car seat greatly reduces the risk of injury or death in a vehicle crash. In general, children should ride in a rear facing seat until at least the age of 2, then ride in a forward facing harnessed seat until they outgrow the seat by height and weight, then move to a booster seat until they can pass the 5 step test. Don’t be in a rush to move your child to the next type of seat or to just the seat belt alone. Is the seat installed correctly? Before you install any child car seat, you need to read the manual that came with that seat and also your vehicle owner’s manual. Both provide vital information on how the child car seat is to be used in the vehicle and where to place it. When a child car seat is properly installed, it should not move more than one inch front to back or side to side when checked at the belt path only. You should use either the vehicle’s seat belt or LATCH system to secure the child car seat, not both, unless approved by BOTH the vehicle and child car seat manufacturer. If you use the seat belt, make sure you know how it locks to keep the child car seat in place. 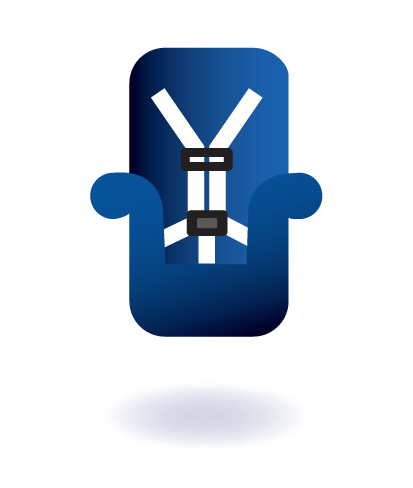 Are you using the harness or seat belt correctly? On a harnessed seat, the harness should be at or below the shoulders for rear facing, then at or above the shoulders for forward facing. You also need to make sure the harness is tight enough using the pinch test. You should not be able to pinch any of the harness strap at their shoulders, your fingers should slide off. In a booster seat, you need to make sure the lap portion of the seat belt goes over the pelvic bone or upper thighs, not up on their abdomen. Then, the shoulder portion should not be falling off the shoulder or digging into the neck. Is your child riding in the back seat? All children under 13 should ride in the back seat. Do you have any loose items in the car? Any loose items in a vehicle, such as toys, purses, laptop bags or umbrellas can become dangerous projectiles in a crash or sudden stop and cause severe injury to a child, other passengers or the driver. Make sure to secure loose items and provide children with only soft toys to play with in a vehicle. Is your child’s car seat expired? Most car seats expire 6 years from date of manufacture. Few others expire 7 or 8 years from date of manufacture. Check your owner’s manual or stampings on the car seat to see when your child’s car seat expires. Is the integrity of your car seat questionable? First, where did you purchase your child’s car seat? If you purchased it second-hand or found it discarded, you should purchase a new seat. Why? There is no way to know if it is expired, has been recalled, was ever misused (i.e. harness straps put in the washer) or involved in an accident. Second, if you were involved in an accident, the car seat most likely needs to be replaced. Check your owner’s manual or with the car seat manufacturer to see what their replacement requirements are. At-fault insurance should pay for replacement. For more on this topic, see this article. Is your child over-bundled? Fluffy coats or baby buntings can compress greatly in an accident, making the harness too loose on the child, putting them at risk for ejection from the seat. Put a blanket on them, put the coat on backwards after they are buckled in, use a cover on infant seats that goes over the whole seat (looks like a shower cap, not a bunting bag that goes in the seat), or a product like the Car Seat Poncho. Are you using after market products? Almost all car seat manuals include a warning statement about not using products that didn’t come with the seat, things like head supports, harness strap covers, bunting bags, etc. These items may cause extra space around your child or compress differently in an accident then how the seat was initially tested. Yes, the package says it is crash tested, but it may not have been tested with your specific seat, so you don’t really know how it will interact with your seat in accident. Do you know the child restraint laws in your state? Most notably, there were some changes to the law in Arizona. The previous stated that children need to be in a child restraint until the age of 5. The new law, which took effect on August 2, now adds that children between the age of 5 and 7, that are under a height of 4’10″, will need to be in a child restraint. Please note, in most cases, the law is the bare minimum requirement, best practice suggestions are different, and I will discuss those more throughout the week. On August 2, Arizona will become the 48th state to have what is referred to as a booster law. Why call it a booster law? Because this law will now include children in the age group where a booster seat is most likely the appropriate child restraint for them to use. 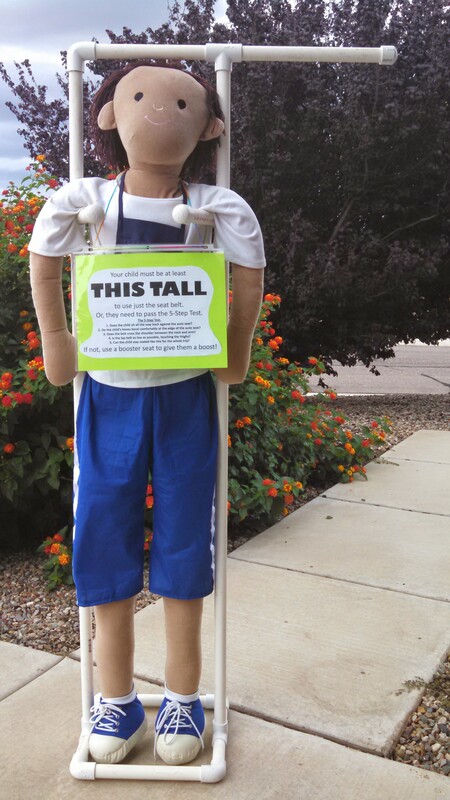 Currently, the law in Arizona states that children need to be in a child restraint until the age of 5. The new law, taking effect on August 2, now adds that children between the age of 5 and 7, that are under a height of 4’10”, will need to be in a child restraint. If you answered no to any of those questions, your child still needs a booster seat. Boosters help make sure the seat belt goes across the strongest parts of your child’s body for better protection in a crash. They are relatively inexpensive, most backless boosters are $20 or less. Do you live in another state or will be travelling through another state, and are unsure of the child restraint laws there? Click here to see a summary of the laws in each state. I had wanted to get this done yesterday, but I was exhausted after the morning. Both things that I am currently volunteering at, Bountiful Baskets and car seat checks with San Pedro Kiwanis, were both scheduled at the same time yesterday. Lucky for me, they were both in the same area! So, I was able to go back and forth to both yesterday. 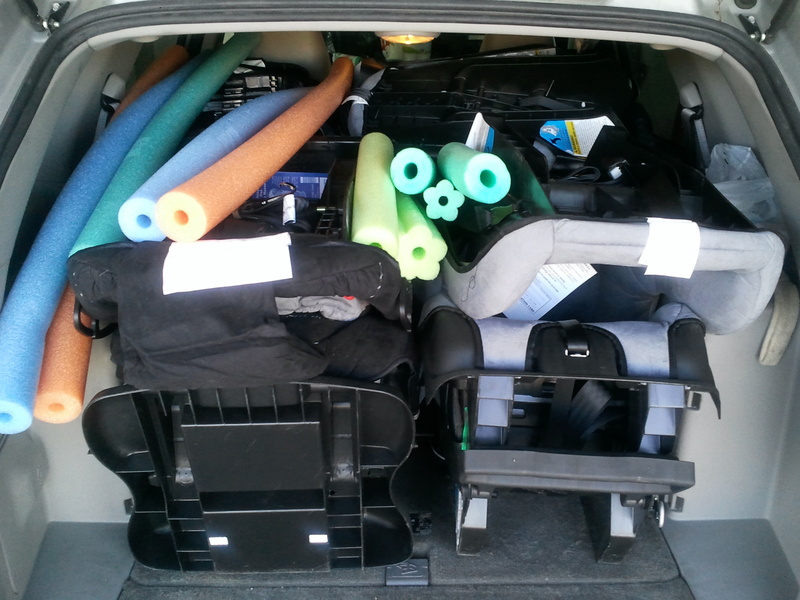 First, my car was loaded up with new car seats to have on hand in case we had to replace any during the seat check. They just fit into the back of my Chevy Equinox! 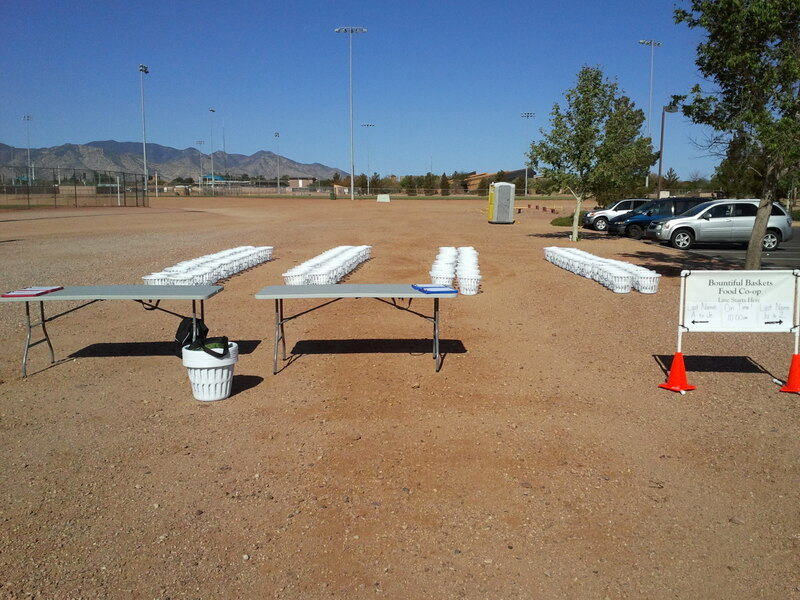 I stopped and unloaded them, and set up other things for the seat check, then headed over to the Bountiful Baskets site to drop off the sign I made and help them get started on set up. I like that it’s open and has great scenery with the mountains in full view. 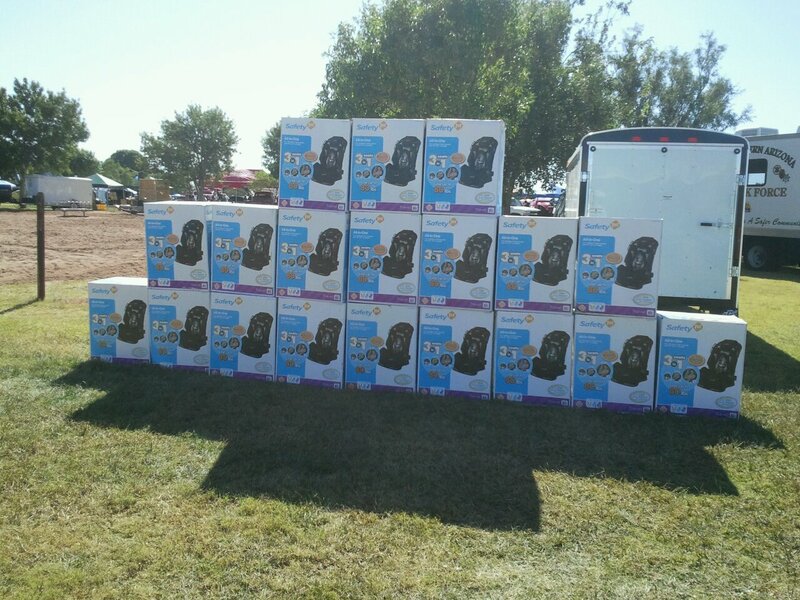 I then was at the seat check for most of the distribution time, and we ended up checking 10 car seats overall. I was happy with the amount, and we had plenty of technicians on hand to help. When it was time, I went over and got my basket. This week, I only got the conventional basket since I didn’t want to worry about getting extras since I wasn’t going to be on site most of the time. Lots of good things this week! 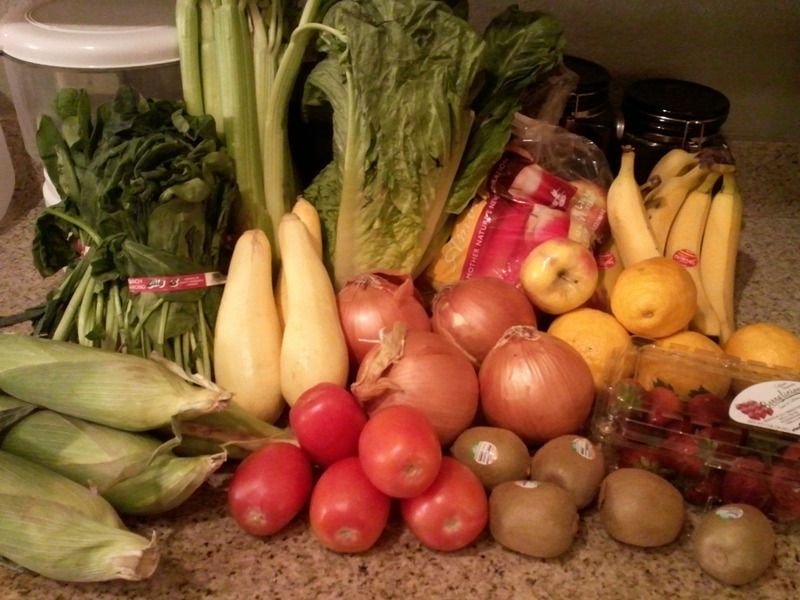 Spinach, corn, celery, yellow squash, Romaine lettuce, yellow onion, Roma tomatoes, Ambrosia apples, bananas, lemons, strawberries (some are missing because my daughters got to them before I could! ), and kiwi. And, here is the link to last week’s basket post since some of the items are the same! This post is participating in a Bountiful Baskets Menu Plan Link-Up with Healthy Mom’s Kitchen to share recipes and menu plans using Bountiful Baskets items. 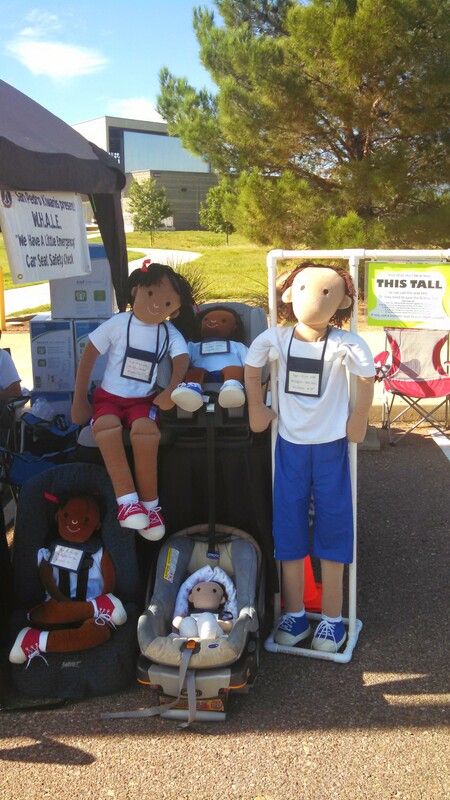 Since I do not have a job that being a Child Passenger Safety Technician Instructor is a part of, it sometimes is difficult to find opportunities to do community events. Back in July, I was contacted by the San Pedro Kiwanis to help them at a Back to School Fair in our city. The Kiwanis Club does a number of community outreach programs for kids, and one of those is the WHALE program. 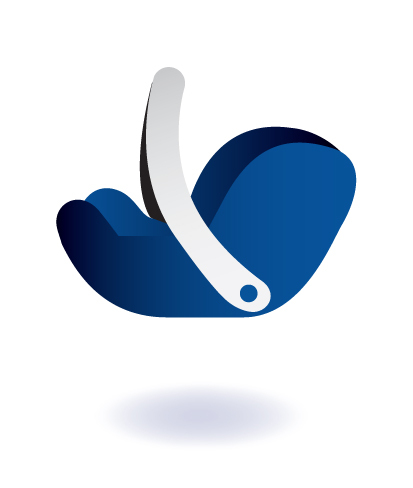 WHALE stands for We Have a Little Emergency, and is used to help emergency personnel care for a child in a crash if the parents can’t speak for the child. The first sticker is a bright-colored sticker, and you put the child’s name, any allergies or medical conditions, and emergency contact names and phone numbers. Then, there are 2 stickers that say WHALE that go on each side of the car seat to let emergency personnel know to look for the information sticker. The last 2 stickers say WHALE as well and go in the rear vehicle windows, again to let emergency personnel know to look for the information sticker. At the Back to School Fair, they wanted CPSTs available to do car seat checks along with putting these stickers on car seats. At that event, there was another CPST and myself, and we checked and put WHALE stickers on 13 car seats. Then, the Kiwanis Club contacted me again about doing a car seat check event to distribute more WHALE stickers. This time we had 4 CPSTs and one of the CPSTs had recently obtained a number of car seats, so we had car seats available to give to people who came with no seat, an expired seat, or an outgrown seat. We got 20 seats checked and stickers on that day, 10 of which were new seats we gave out that day. It was a really great event, and the Kiwanis Club members are a great group of people to work with. Hopefully we’ll be able to have another event in the spring to continue to get the WHALE stickers out there and to make sure seats are properly installed to keep kids safe in the car. Here is a picture of some of the seats we had that day. 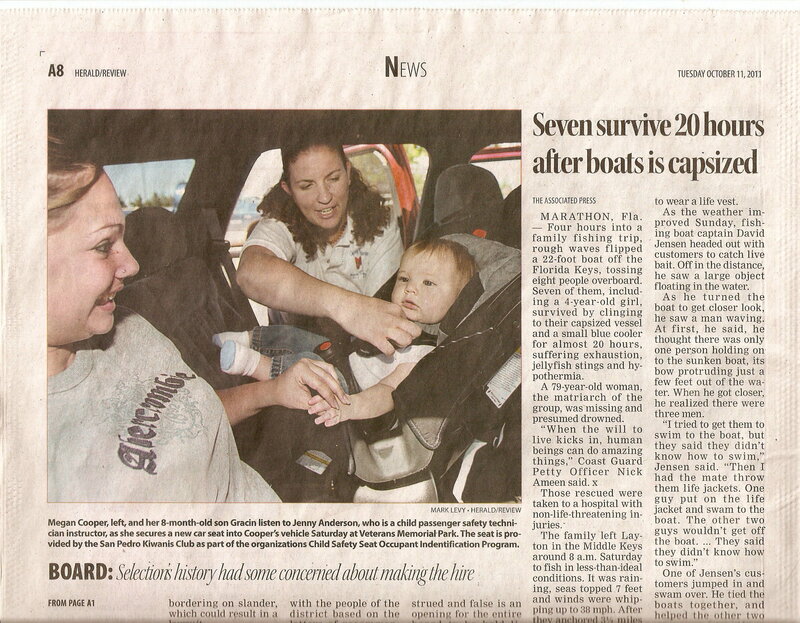 And here is a scan of a picture and blurb in the local paper of myself showing one of the moms that came in for a car seat check how to check for proper harness tightness at the shoulder.